Olaf Wieghorst (1899-1988) was one of the foremost western artists of the 20th Century, earning him the title "Dean of Western Artists." Olaf was a real cowboy and horseman. His paintings were a record of his own experiences. The legacy of art he left us had a truth and realism seldom matched. The complete works of Olaf Wieghorst would fill many volumes this size. 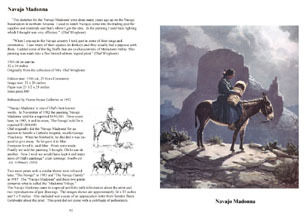 This book was intended to focus on the art which became limited and open edition prints. 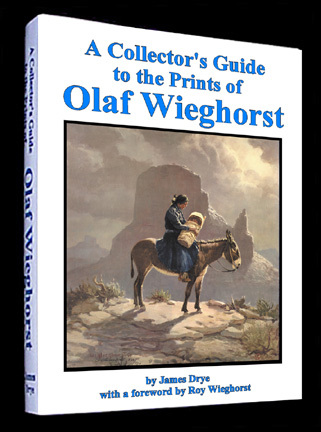 As an aid to collectors I have compiled information on the ninety-two major prints Olaf Wieghorst released over a period of thirty years. I have also included information on other prints, posters, art books and magazines featuring the history and works of this artist. A price guide for these prints is also included. This first edition book, just published, is a limited edition of 2000. 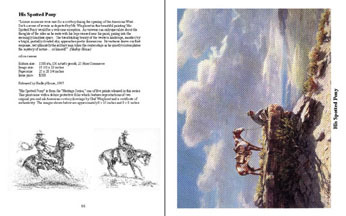 It is 8 1/2 X 11 inches and contains more than 250 pages including over 100 full page color images. It is printed on 80 lb. acid free paper and is hard bound in blue leatherette with gold embossed title and spine, and includes an attractive dust jacket. 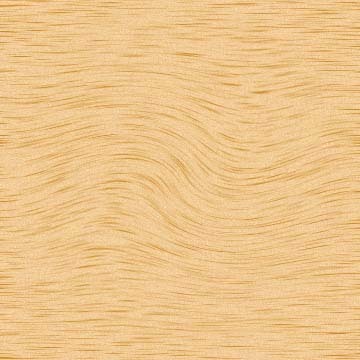 The sample pages shown below are double 8 1/2 x 11 inches.